Larger than life, Wesley Robertson left a big hole in our universe when he shuffled off this mortal coil for that Great Festival in the Sky. The shockwave has spread beyond the circle of friends and family here, to wherever Rockin' & Stompin' could be heard on Saturdays for the past few decades via the airwaves at KVMR.org. We are hearing from listeners all over the place who regularly made him a part of their lives during his Saturday radio show and his live remote broadcasts, and they feel he is a part of their family as well, and are sorely missing him. We are gathering in Love and Support to help take care of his wife Mo (Marian) and daughterJaimie during this transition to a world without Wes. Many needs arise in these times, and we want to be sure that the grieving and healing will not be hampered by financial worries. We are asking for love and monetary donations to this Memorial Fund to assure that his Mo and Jaimie will have the time and resources they need to process through this tender time. If you have ever felt Wes' generous spirit, we hope you can help here. All are welcome to the Celebration of his Life which will take place on Saturday, March 17th, 2018 at The Miners Foundry in Nevada City from noon til 4ish. Wake the Dead will be performing their scheduled gig that evening at 8pm at the Foundry. They have been heard regularly on Wes's show. This show is co-produced by Scott Holbrook and Keep Smilin' Productions. You also are encouraged to post your stories and photos here in the comments. Wesley Robertson was an integral part of KVMR's volunteer core for over 30 years. He also hosted "Rockin-N-Stompin" from 2-4 p.m. every Saturday since 1990. WHEN: Noon to 4 p.m. Speeches and greetings at noon; music and jam session at 1 p.m. 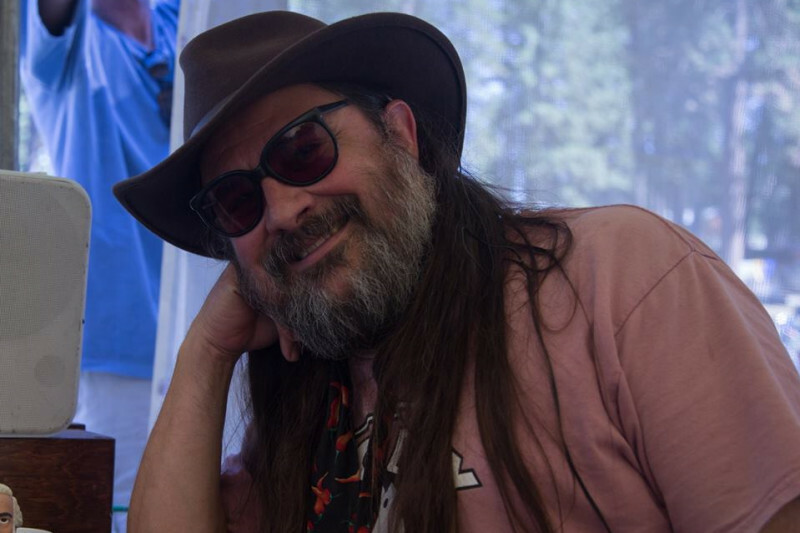 The KVMR and Strawberry Music Festival communities will come together at noon Saturday at the Miners Foundry in Nevada City to celebrate the life of Wesley Robertson. Robertson had hosted "Rockin-N-Stompin" from 2 to 4 p.m. Saturdays on KVMR 89.5 FM since 1990. He was an integral part of the non-profit station's volunteer corps for more than 30 years and a passionate proponent of live music programming and festival broadcasts. He produced the station's live broadcasts of California Worldfest, the High Sierra Music Festival, the KVMR Celtic Festival, Hangtown Halloween, the American River Music Festival and On the Road Live. More recently, he co-hosted "The Beer Show" once a month on KVMR with Tom Dalldorf. Robertson died March 4 at Sutter Roseville Medical Center after an automobile accident in Grass Valley. His wife, Mo Fitzpatrick, and daughter, Jaimie Robertson, were at his side, and he was listening to tunes by his beloved Willie Nelson. "I'm at a loss for words. My heart is aching. He was always 'Rockin-n-Stompin' at KVMR and all 'round this crazy world. What a blessing to have known this Ambassador of Music, Community and Artful Living. He was a cheerleader, matchmaker, mischief-maker, educator, enthusiast, entertainer … and humanitarian with a microphone. He was off the cuff, available in the moment. He was always part of the team … and he blazed his own trails. "He was a curator, a connoisseur, a confidant and a beloved character. Like many radio personalities, he led a magical, wondrous and creative double life. He was a voice of weekly comfort, a friend to us on the airwaves, the web and with a warm handshake and hug on the street. He was a footbridge to musical magic at one of your favorite music festivals." Craven's post continued: "His heart, his art was bound to the music … and like us all, he is bound to go away. Not yet, dear friend. Are you really gone? Yes, and yet you never will be. We love you so. You are for the ages for those so fortunate to know your voice, your passions, your knowledge, your friendship. You will always have a place at the table of my heart. I remove my hat, fill my glass and tip it to you. Honey, where is my fiddle? I want to play a 'Rockin-n-Stompin' tune for my friend Wesley Robertson." Craven will be bringing that fiddle Saturday afternoon. Also expected to be on hand are Robertson's 94-year-old mother and his siblings, who want to celebrate his life with his radio and Strawberry Music Festival friends. The event, hosted by Robertson's wife and daughter, is a potluck, and guests are invited to bring Wesley's favorite food: pizza. A memorial fund has been created at http://www.gofundme.com/Rockin-Stompin. Thomas Greener, host of KVMR's "Ragged But Right," said, "The times I spent with Wes are indelibly etched in my mind and heart. Before membership drives at KVMR, we would almost always meet at his place in Auburn to 'set our plan.' We would spend hours going through and listening to stuff that we wanted to use, often saying together, 'We can't play that,' then finding 'reasons' that we should. Often we were laughing so hard we just had to stop for a while. "The station will never be the same, and at this point I have no idea how I'm going to get through the next membership drive with Wesley not there." Broadcaster Allen Aastrom said, "I had the good fortune of being tangled up with Wesley the last 15 years, engineering and producing live music broadcasts for KVMR. The endeavors would often start with him calling me on the phone to ask, 'Can Allen come out and play?' Fun was always a requirement. I am sure going to miss those calls." "What I'll always remember about Wesley is how much passion, love, and charm could fill up that man," Aastrom said. "He radiated enthusiasm and endeared so many people because the little things in life mattered to him. Wesley would often say, 'Life is what happens when you are busy making plans.'" KVMR General Manager Julie Chiarelli said of Robertson, "Most of us have dreams. Wesley lived his dreams. He had passion and a tremendous love of music and for the people in his community. Everyone he met was a friend and every day of his life was a testament to what he valued. We are sad beyond words." There will be free shuttle service provided by The Yuba Bus in Nevada City for The Celebration of Wesley's life on Saturday March 17th. Shuttle service begins at 10:30am from the Rood Center (950 Maidu) to Miners Foundry (325 Spring Street). The Celebration starts at High Noon and runs till 4ish. Thanks to Preston at The Yuba Bus! Here's another video from the Rockin' & Stompin' Tribute show on 3/10. Bob Woods, Juliet Gobert, and Shelby Snow playing Ripple with a chorus of friends. Big thanks to all who are donating to this fund. Tell a friend. Mo and Jaimie are deeply appreciative. We will also be streaming the Memorial on 3/17 on the KVMR Facebook page. For those of you who can't attend in person, we hope you will connect then. It starts at noon.